The inaugural inclusion of the module titled Me and My Health and Wellbeing took place last Thursday. 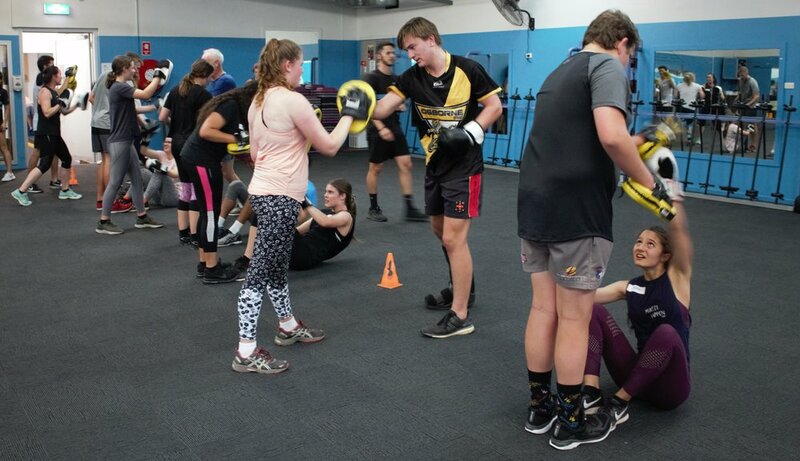 In this module the students commenced with an exercise class at Workout Wagga. Dayna Kahlefeldt and Nick Leary took the students through a boxing circuit before finishing with a yoga session. Dayna imparted on the students how important balance is and that exercise is a good outlet for stress. The students then proceeded to the Townhouse where a session on Food for Fuel was presented by Dietician Jocelyn Williams. Jocelyn gave the students ideas on having more fruit and vegetables in their diet, the importance of drinking water, don’t skip breakfast and add colour and variety. The students were very interactive and asked many questions. Dr Carl Henman then gave the students a presentation. Dr Henman included some components of health and wellbeing – Physical, Emotional, Mental and Spiritual he left the students with a message as follows “No one thing, success or failure defines you or your pathway in life”.